Back from Black Mountain NC, and back at the easel – laid in the bench today. Found out I’ve been accepted for another juried show – Metropolitan Strozzapreti is going to the Atlanta Artists Center Annual National Juried Exhibition (opens Sept. 6 in Atlanta’s Buckhead district). I’m psyched! Working on the big San Marco piece, the detailed commissioned view of Venice and the sweeping sky scape of Isle of Palm II makes me feel wonderfully stretched and supple. It’s like running, swimming, and yoga each use muscles in a different way. I finished the tomato – signed it on the vinegar bottle. Did a few small adjustments to the salt & pepper. Next week I’ll varnish it. And in a couple of days I’ll paint the sides with a dark gray color I plan to mix. Spent the rest of the day working on the Met. 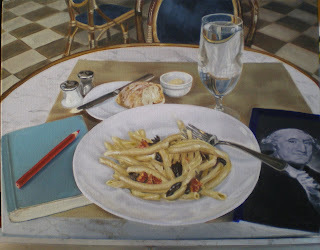 All over it, but notably the glass, a few more layers on the pasta, the table edge, a reworking of the salt and pepper, the fork got an upgrade, as did the knife and bread, and the chairs. Actually the only things I didn’t touch were George Washington and the sketchbook. In a few days I’ll tackle the lettering on the museum map. It was so good to devote a day to the brush. I did check my email periodically and fax an invoice. But this was a sweet, sweet day. Tomorrow I’ll work on the new Venice drawing. After I check it carefully I’ll probably spend the whole day mixing my start-up colors. Here’s the last version of the tomatoes. More refining to come, especially around the lettering and the salt and pepper, but it’s close. Here’s a somewhat blurry and blue-ish (shot late in the day when the light was almost gone) photo of the Met painting. 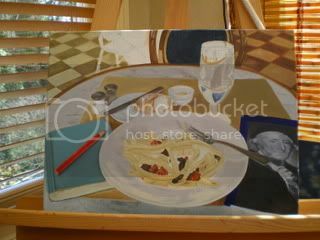 I’ve added the background chair, more layers to the tile and worked on Washington. The pasta is slowly coming into focus. I’ll probably do the glass next. Much, much more to do here. Here’s the Met, with the olives and tomatoes popped in, and the first layer on the portrait of Washington that’s on the cover of the paper museum guide. Here’s a close of that detail. It’s still splotchy and vague, but it’s ‘lying down’ on the page which is a big deal for me. Another round on the tomatoes, this time the balsamic label. I had fun with that because I didn’t paint the letters. I painted the dark shapes around them. Of course I’ll paint the words too, in due course, but there is something magical about painting dark curves and angles and having letters appear. Good painting morning, so I thought I’d upload two that are on the easel so you can see the progress. First, the tomatoes. This week I added the place for the lettering (on the left side of the book cover (the book title is like the place in a church where they post they hymn numbers) and refined the tomato surfaces and plate edge. When it’s drier I’ll work on the balsamic label and intensify the salt and pepper. The author’s name goes in big letters across the top. I’m thinking about putting my name on the balsamic label. And this is what I was just working on – a lunch I had at the Metropolitan Museum of Art in NYC. This is really early in the painting – I don’t even have all the white of the canvas covered yet – but you can see where it’s going. Today I added the red caran d’ache pencil and it really pops. I’ll wait until I’ve got one layer of paint on everything before I decide whether to dull it. Gave the sketchbook another layer of blues, filled in the fork and the salt and pepper. Yesterday I started the pasta. The spaces have olives and sun-dried tomatoes in them, dark rich colors, so I’ll wait for the pasta to dry before I go in again there. Maybe work on George’s face next or the glass reflectins. I’ve got another chair to add behind the table, and am thinking about dimming the tile floor with several layers of glazes. About tomatoes – one day I may tire of them. But not yet. There are very southern. 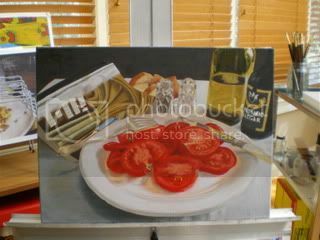 Someday I’ll try to paint a tomato sandwich on white bread. Done properly, you have to eat them dripping over the sink. And my daddy always planted tomatoes in the garden when I was growing up. That and hearing crackly baseball play-by-plays on the radio reminds me of him. Meanwhile I’ve worked on the Priest’s Laundry. I painted two doors, the upper story windows with curtains, and canal level windows with bars (also mesh – got to keep those wharf rats out). The remaining white canvas is a bit of the brick wall, the guard rail of a bridge (the one I’m standing on to take photo) and the laundry. It’s going to have to be dry as a bone around the laundry before I do it so I can lift any errors or wobbles with turp without erasing the background. Now I’m starting a third canvas – the paint is so wet on the other two that it just makes sense. This is the lunch at the Metropolitan Museum of Art in NYC last year. Did 90% of the drawing. Love the blues. Decided to swap out the yellow #2 pencil in the photo for the Caran D’ache red pencil my daughter bought me in Paris when she surprised me with the blue sketchbook. 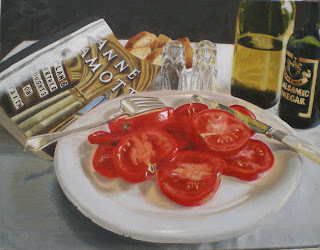 Finished the drawing in time to paint a bit more on the tomato – worked on the knife handle and bread. Then mixed the colors for the Met painting. 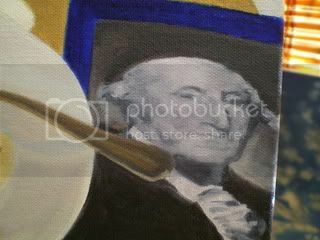 Realized Gilbert’s George Washington portrait on the museum guide is particularly appropriate to paint this year. Great colors to work with – all those luscious blues! And there’s a tile floor that stretches away in the background, like a little Flemish nod.